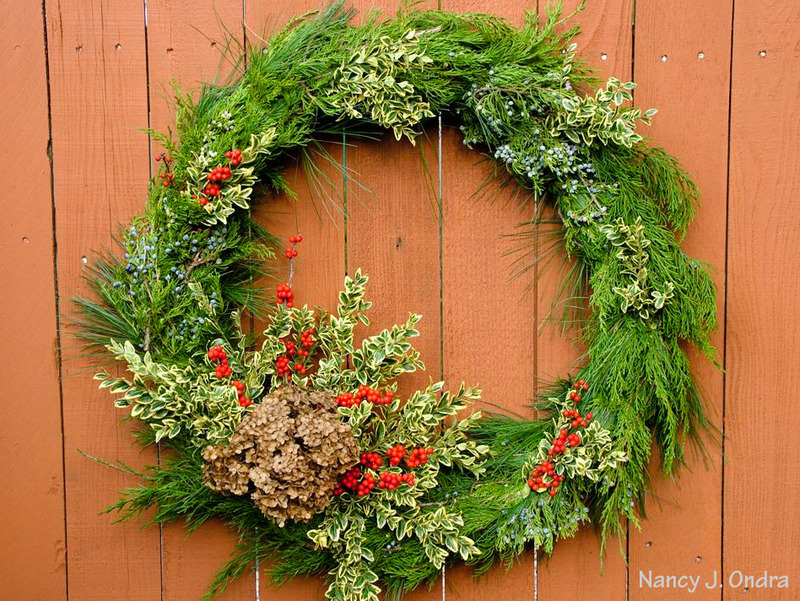 Dress up a plain store-bought wreath or make your own with trimmings from your home landscape. One of the wonderful things about having a garden in your life is that you always have fresh flowers on hand. Even if you don’t have a space specifically for cut flowers, there’s no reason you can’t snip a few blooms from your beds and borders for the occasional indoor arrangement or gift bouquet. With a little planning, your yard can provide a bounty of materials for indoor and outdoor decorating in fall and winter, too. The brilliant red stems of ‘Britzensis’ willow (Salix alba) show off beautifully among rich greens. 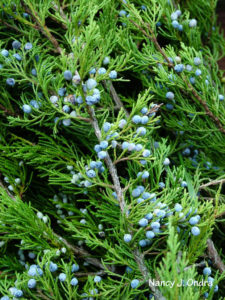 Instead of relying on fast-growing annuals and perennials, a cold-season “cutting garden” depends on woody plants with features such as evergreen foliage, bright bark, or beautiful berries. Planted individually, these shrubs and trees would take up a lot of space. Set at fairly close spacing in a shrub border, though, they can do far more than just provide material for holiday decorating: They’ll create a diverse, colorful, low maintenance, and wildlife-friendly landscape feature that you can use to mark a property boundary, dress up an unused side yard, block an ugly view, or enclose some part of your backyard for privacy. In fact, the only place you wouldn’t choose to use a feature like this is in a front yard or other high-visibility area, where you’d want the plants to look perfect. In an out-of-the-way spot, you can cut freely without worrying about careful pruning and shaping. The amber-tipped yellow foliage of ‘Forever Goldy’ arborvitae (Thuja plicata) is perfect with pumpkin orange for fall and Thanksgiving decor. Evergreens, of course, are a key part of an off-season cutting border. 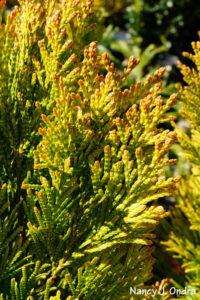 Start with classic broad-leaved and needle-leaved kinds, such as boxwood, arborvitae, pines, and spruces, for an ample supply of solid-green greens. Then, look to cultivars with other colors in their foliage. 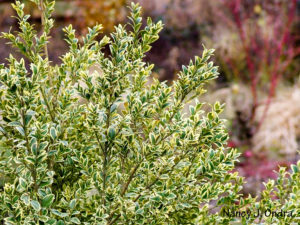 Those with yellow or yellow-variegated leaves are especially versatile, because they work equally well in fall and winter arrangements. Powder blues and white-variegated cultivars are right at home in all sorts of winter decorating projects. ‘Elegantissima’ English boxwood (Buxus sempervirens) is elegantly edged with cream. If you’d prefer yellow markings, consider ‘Golden Dream’ of ‘Latifolia Maculata’. Deciduous shrubs and trees with colorful stems are invaluable for adding height to seasonal arrangements. 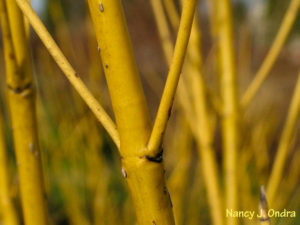 Shrubby dogwoods (Cornus) offer some especially eye-catching stems once they drop their leaves. Include a variety of colors in your shrub border, such as red-stemmed ‘Cardinal’, yellow ‘Silver and Gold’, and red-orange-yellow ‘Midwinter Fire’. 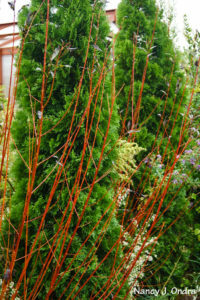 There are some wonderful willows (Salix) with showy stems, too, such as ‘Britzensis’ and ‘Scarlet Curls’. Cutting the stems of shrubby dogwoods encourages an abundance of vibrant new growth. Berries are another must-have for a cutting border. 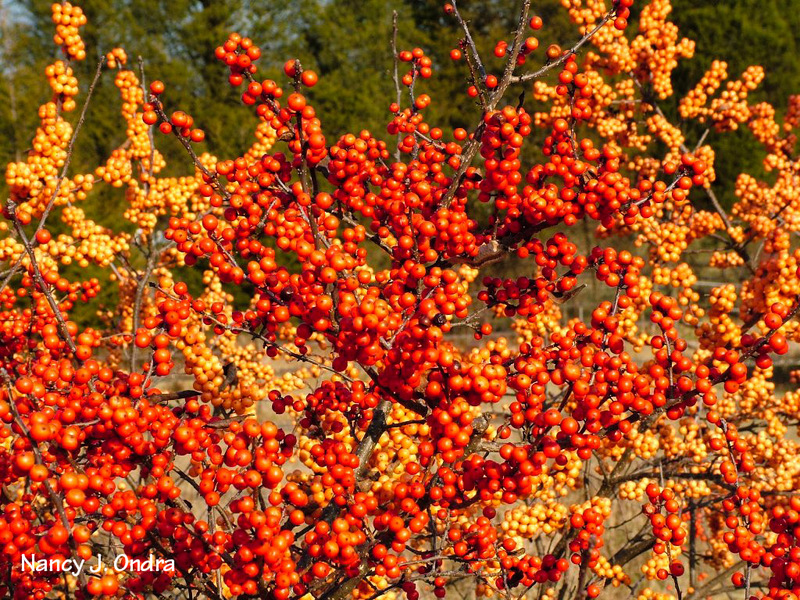 Start with at least one deciduous winterberry holly (Ilex verticillata)–well, at least two, since you need both male and female plants to get the berries. Heavy-fruiting ‘Winter Red’ is one of the best cultivars of winterberry for Christmas decorating. If you have room, also try orangey ‘Winter Gold’ or yellow ‘Berry Heavy Gold’, which are wonderful for fall arrangements. 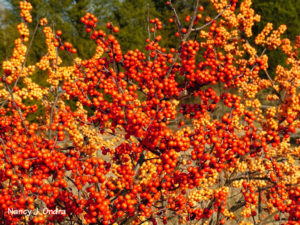 Some other fruit-bearing woodies that work well for cutting include northern bayberry (Myrica pensylvanica), crabapples (Malus), and red chokeberry (Aronia arbutifolia). 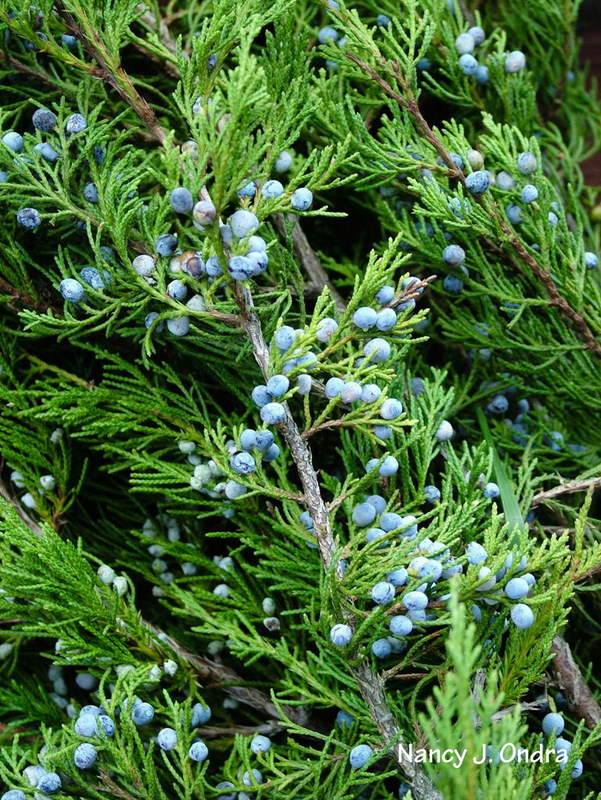 Our native Eastern red cedar (Juniperus virginiana) does double duty for decorating, supplying evergreen foliage as well as beautiful berries. Evergreen hollies also provide both features. 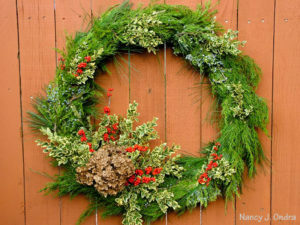 Use plain-green greens as the base for wreaths and swags, or as fillers in indoor arrangements and outdoor containers. Then, dress them up with the colorful stems and berried branches as accents. 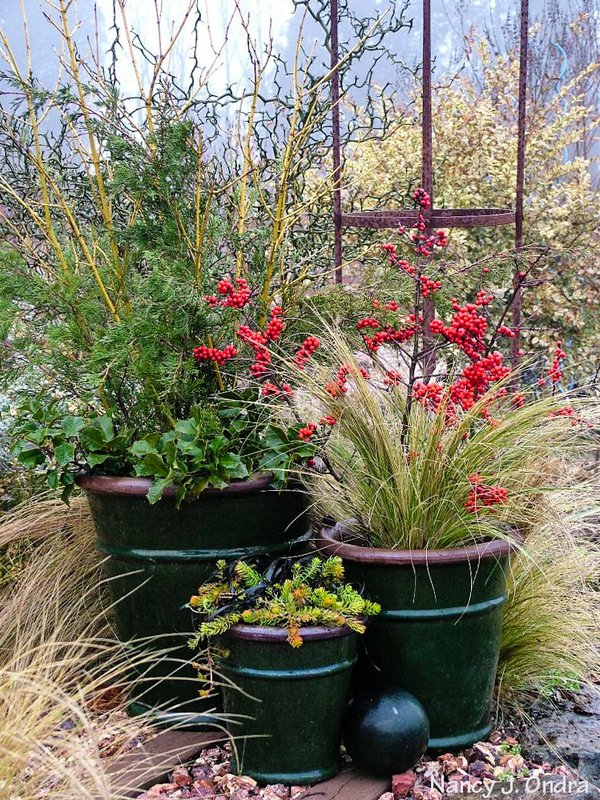 Your favorite frost-proof containers can provide color all year ’round. 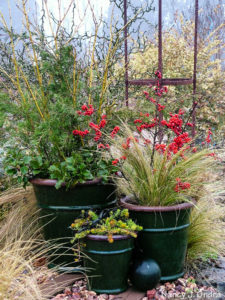 Once the growing season is over, replace the annuals or fill around remaining hardy plants with cut greens, showy cut stems, and bright berries. While you’re out harvesting from your winter cutting border, check out your other plantings as well. If you haven’t yet cut down your perennials and ornamental grasses, you may be able to find interesting seedheads that will give your holiday decorations a designer touch. Alliums with large flowerheads produce fascinating seedheads too. If you want to make sure they’ll last for winter decorating, gather them when they’re completely brown in summer and store them in a shed or garage so they stay dry. 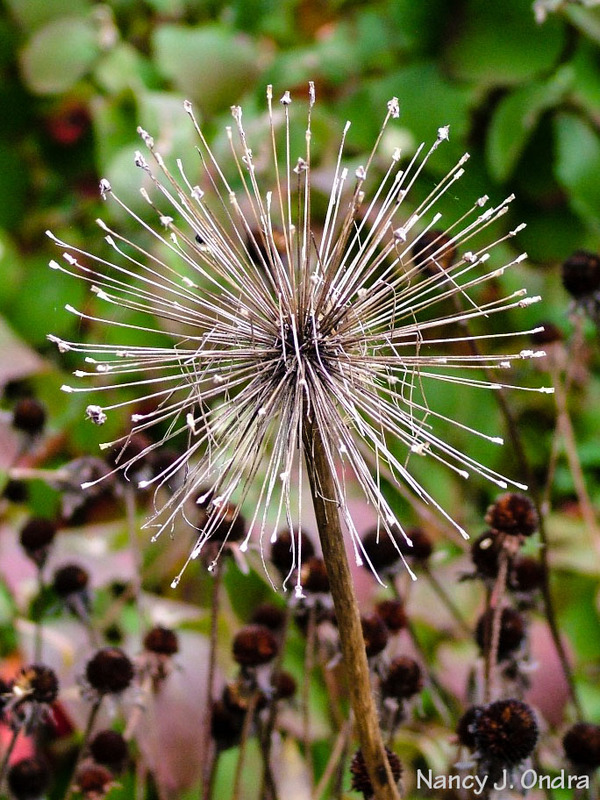 Alliums, baptisias, coneflowers (Echinacea and Rudbeckia), Siberian iris (Iris sibirica), and rattlesnake master (Eryngium yuccifolium) are just a few perennials with shapely seedheads. 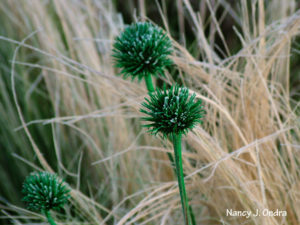 Enjoy their natural range of brown to black shades, or dress up interesting seedheads with a spritz of spray paint for a surprising color accent!